26.5 in. vert. by 51 in.horiz. I attended many Gallery Players productions as a child. Also, my older sister Rhonda performed in Kismet, and my twin sister Marla and I performed in a Junior Gallery Players production of Grease, in which Marla played Cha Cha, and I played Doody. I’ll never forget the embarrassment of my solo performance of Those Magic Changes, for which I was strategically chosen, since at the time, my voice was changing. I am sure that however painful it was for me to sing, it was even more so for the audience to hear! 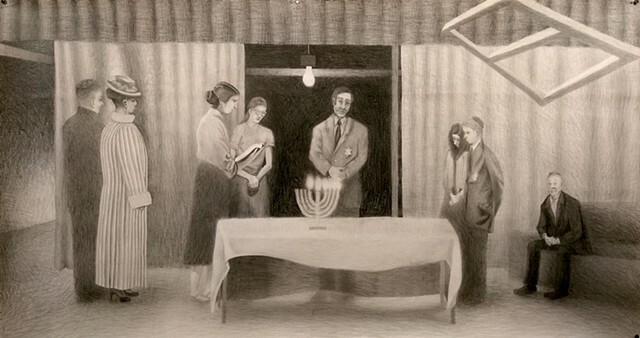 Depicted in this drawing is the Chanukah scene from Anne Frank, which featured well-known local personality Burt Louis, father of my friend Steve, who interviewed celebrities for the prime time television show Front Page Saturday Night.